Sound Transit staff will inform the agency’s board today that the Federal Way Link extension’s official cost estimate will increase from $2.088 billion to $2.549 billion. The notice comes a year after the agency announced similar budgeting problems for the Lynnwood Link extension. According to Sound Transit spokesperson Scott Thompson, the Federal Way cost increase is driven by the same issues that drove up Lynnwood’s budget. The Puget Sound region’s gobsmacking real estate market has increased the price of land acquisition. Right of way, stations, and parking garages are all much more expensive than the agency’s 2015-16 cost estimates predicted. Construction is similarly pricey, as the development boom has created a hypercompetitive contracting bid market, especially for technically sophisticated projects like light rail. According to construction firm RLB, the U.S. average for construction costs increased from 2017 to 2018. Seattle had one of the highest local cost increases, trailing only Portland, San Francisco, and Los Angeles among major markets. Fortunately, ST was able to reduce the Lynnwood cost increases by $200 million to $500 million. Cost cutting measures included removing down escalators, changing the concrete used to build stations and guideways, and shrinking platforms. Similar mitigation could presumably happen for the Federal Way project. ST will also introduce a new cost cutting method: combining the design and build contracts for Federal Way into a single bid. According to Thompson, ST is confident that the new bid method will reduce costs, but said it was too premature to say how much money the new bidding process will save. If current real estate and construction trends continue, more cost increase announcements are likely to follow. Correction: The Lynnwood project’s cost increase was decreased by $200 million, not to $200 million. But that 1% that always must go to art? Yeah, can’t touch that. Gotta remove an escalator or add a street crossing requiring beg button for bus transfers. If they include the new cost overruns in the 1% they always with no exception reserve for art, they’ll have to spend ~$4 million MORE on art just because the project got more expensive. Can Sound Transit minimize the risk of land acquisition cost inflation for ST3 by buying land early in the process? Land acquisition is usually a longer lead item, even if there’s money available up front. Property owners tend to not want to just up and sell their property, even at fair market value. Using 20/20 hindsight, ST should have taken their master plan 15 years ago and start edacquiring property, even if the lines were still 40+ years out. But I’m not sure the rules behind ST being a landlord. I know WSDOT isn’t allowed to be a landlord; I think they buy and vacate the tenants as soon as possible. Don’t forget that there are also federal regulations involved as far as early ROW acquisition whenever federal transit funds are involved. um. more usefully: downsize the expensive, completely optional but untouched items. Try getting that past South King. Or any of the suburban subareas, which are the majority of boardmembers. Well, if that helps in actually getting a train to their community, they may decide to forgo the parking structures or build them themselves… or allow parking to be a revenue source for the agency. the ST people I spoke with at the Lynnwood Light Rail Station event on Tue said that federal funding was contingent on preserving the (1400) existing parking spaces. not sure that applies to the federal way stations, but I suspect that also means that the parking will be built before the station – to minimize disruption for existing commuters. Only if the garage is built before the station. When the scheduled time comes to build either of them, if it looks like the federal funding is definitely not coming, then ST may have to make a more fundamental decision to delete the P&R rather than end up with the ridiculous situation of a garage with no station. It’s not the timing or the order of the garage and station construction that matter to the feds, but simply that the plan is not substantially modified from the one they approved (which means only that ST can’t delete the garage, not that it can’t postpone it or reorder the schedule). The grant is for the entire project in the application, not for the garage component per se. It’s just that deleting the garage is like ordering a Canadian bacon and pineapple pizza and then the restaraunt decides to omit the pineapple to lower its expenses: that’s an incomplete fulfillment of the contract. Which it would be if one of the goals/requirements is to minimize impact on current commuters. The vacated buildings adjacent to the Lynnwood TC are being torn down as I type. I expect that area to be used for staging and parking as the old spots are replaced by the garage. At best, the station construction will happen at the same time. Actually, one of the provisions in a state law — I forget which one — says that if it has to make budget cuts within a subrarea, it must prioritize deleting P&Rs first and light rail last, and other modes in between. Doesn’t the 1% for art only apply to construction costs? So, if the majority of the cost increase is for land acquisition, the additional money for art should be a lot less than $4 million. Yes. The mandatory art allocation is based on project construction costs. Alex, when we were first designing the Downtown Seattle Transit Tunnel we seriously considered turning the decoration of our stations over to Water Quality. But when they calculated all the forces, physical, mechanical, and hydraulic necessary to force anything, let alone anyone, to go into the facility at all, that Division calculated that 1% of project budget would just about cover the amount of tile, ceramic, and metal to barely pay for the fitting with the giant chrome handle at each end. So get me the advertising budget, Alex. Then we’ll talk. All I can say here is….we all saw this coming. Just wait. Even with the little accounting games ST has played with the Northgate and East Link projects, those projects too will be over their ORIGINAL yoe estimates. It is very clear to anyone that has been paying attention to the way ST does business over the last twenty plus years that they over promise and under deliver. They can’t estimate project costs to save their lives and can’t deliver projects on time. But they CAN re-estimate, multiple times, project costs to save their lives. And then claim early delivery. Haha. Yup. That’s the name of this agency’s game, otherwise known as moving the goalposts. My realtor asked how much I was saving for a house and I said $15k a year. She told me a couple years ago that would have been good enough, but with house prices appreciating more than $75k a year, I’m actually falling behind my ability to get to 20% down. There’s no way in hell we’d let ST appropriate land, or pay less than market rate, or control market rates in any way, so they have to pay whatever the crazy inflation around here is. They should be given complete slack over that as long as their land needs make project sense. The pass-through may have questionable aspects, but it’s one way to fund affordable housing which as a public policy is in critical shortage, according to some is one of the top three critical problems in the region. It’s so crfitical that the county has declared it an emergency, and is considering declaring it a disaster and setting up FEMA-style tents like after hurricanes. So it may be bad for Sound Transit’s budget, but it may be good for overall public policy. There’s another recent state law that says if ST has surplus land after construction that’s suitable for housing, it must first offer it for free or cheap to anyone who will build affordable housing on it, before offering it to anyone else. I’m not sure who initiated that bill, whether it was general housing activists or enlightened legislators, but one possibility is that Sound Transit asked for it so that it would be legal for ST to sell property to somebody other than the highest bidder. Well, the main question is, what would have happened if ST had accurately estimated the unprecedented increase in real-estate costs? Would anybody have believed it? Would they have voted for a package that size? There’s a fundamental disconnect when you’re trying to estimate a budget based on future real-estate costs that are rapidly changing and about to accelerate to a level never seen before. The only way to prevent it is to buy all the land then. But at that point ST didn’t know what land it would need, and acquiring it beforehand would mean acquiring land before the EIS is finished. We should have done all this planning and land acquisition in 1990. >> Well, the main question is, what would have happened if ST had accurately estimated the unprecedented increase in real-estate costs? Would they have voted for a package that size? Well that’s the problem. Overly optimistic forecasts (for both suburban ridership and cost) makes everything sound wonderful and worth it. But when it comes time to actually build it, both are left wanting. If they had made a more realistic projection, then maybe they would have come up with a different plan. If I recall all of st3 had about $600 million in parking out of a $50 billion dollar budget. So 1.2% of the budget. That won’t cover projects which are 20% over budget. In general people on this blog act liking parking garages are this untapped goldmine, which they are not. Tlsgwm, any chance we saw the results of events of 2008 coming is because we’ve been living with them for ten years out of the last twenty? During which time…remind me, what ALL happened to housing prices? And give me the reason same exact things in both directions won’t happen again? So question to ask is: Assuming answer translates as something possible on Earth, what lessons are we going to learn, and do what with it? So one example, how about this? Pretty much same principle on which we started building transit when our engines wouldn’t deliver enough Forward Thrust to clear the runway. Stay in motion building what we can, when we can, while ordering each piece of the project to transition into the next one. I think we’ve learned enough about transitionally staged development and construction to make this work a lot smoother than the last. Staying ready to speed up soon as possible. Have a feeling that sheer necessity- like absolutely nothing able to move- will make a lot of lanes easier to get. Battery buses will save a lot of wire. And interurbans were streetcars that crossed the County Line at 100 mph. Before street running next municipality. Developers have been doing same with cars, vans, and buses since before bicyclists got them pavement. . And also, whatever really happens next will take a lot less time than between 1962 and now. So, we all get stuck with the bill and their misallocation, and mismanagement of money. The tax payers have the deepest pockets of all. Let the middle class American shoulder the heavy tax burden family and force more hard working people into poverty. This plan never seems to fail. Maybe the constituants of Washington should DEMAND better leaders instead of letting the same tired people lead us down this path. Lets DEMAND they be held accountable for their actions and suffer the consequences of their back room politics. Constituents haven’t demanded accountability for YEARS. Why would they start now? How DARE Sound Transit cause an UNPRECEDENTED escalation in construction costs and RISE in real estate values in this region! I bet the ST BOARD members are laughing all THE way to the bank, while DRINKING $400/glass champagne and coming up WITH schemes to take OUR cars away! Quick, somebody CALL Dori Monson and MyNorthwest to do a fair and balanced investigation! MORE CAPITALIZED WORDS!!!!111!! What we need is a good local recession to reduce costs for Sound Transit. Plus it has the bonus effect of reducing congestion because no one will be driving to work! A recession would reduce capital costs, but the reasons costs were so low in 2008 was due to a convergence of factors that can’t be replicated, so if a recession were to occur now the reduction in costs would be more modest, unless of course the catastrophe were even more severe and unpredictable. One interesting factor is that the price of oil reached record levels in 2008, and some people say it reached a tipping point where people could no longer afford enough oil for their lifestyle and production activities. That was the straw that broke the camel’s back. Of course, at the same time it was also the bankrupcy of certain large banks and shadow banks that triggered it., But in any case, the price of oil reached a record high just before the crash, and plummeted like a stone after it, to an extraordinary low and then remained low for years. That’s because demand for oil suddenly vanished: the people and companies who were buying it suddenly had no money, and were no longer doing activities that required the oil in the first place. Unemployed people stopped driving to work of course, but that was only a minor factor. Most of the worldwide oil demand is in industry: material to make plastic for widgets, to make chemical fertilizer for agriculture, to power machines that make drilling for oil possible, to fuel the taxis and trucks that bring people and supplies to the airport so they can get on a plane and fly somewhere, and power the lights on the runway and terminal, etc. Even most of our food comes from oil: the energy used to grow American monoculture corn and soybeans and irrigate them and the synthetic fertilizer that feeds them come from oil. So that’s one little-known factor. Another is the number of unemployed people in the region relative to the number of positions the agency wants to fill, and how closely their skill set matches it. Another is the relative supply and demand of housing in the region. In 2008 construction was at a high-ish but moderate pace when the crash occurred, and afterward tens of thousands of people who had recently moved here for a job or the lifestyle lost their job and moved back to wherever they came from where they had longer-term family or hometown ties. That created a lot of vacancies all of a sudden, and a lot of vacancies, period. The Summit area usually has one vacancy every block or two, but in 2008 every other building had at least one vacancy. In the 2001 recession I had an acquantance who couldn’t afford his rent, and his landlord let him stay for free because he knew it would take several months to find another tenant anyway. So that;s what it was like in 2001 and 2008, but it’s not how it would be like in 2018. In the 1950’s Seattle’s population peaked, and then it dropped because of white flight to the suburbs and the Boeing Bust. In the 1980s the population started rising again but by 2008 it still hadn’t reached the size it had been in the 1950s, so there were still more vacancies than then, or slack in the market. That dampened the ability of landlords to raise rents. But with the Amazon boom, all that slack was completely filled and squeezed out, and that’s why rents started accelerating so fast, because a small change that turns a surplus into a deficit has a much more dramatic impact than a small change that turns a large surplus into a slightly-smaller surplus. Likewise, houses were historically on the market for an average of 30 days or longer before they sold, and in recessions sometimes it would take several months for a house to sell. But in the crash, sales and construction halted because suddenly buyers had no money or financing. And it remained dormant for several years until buyers recovered their wealth. Now buyers have money, and suddenly there’s a large influx of new buyers — many new Amazon employees, and their salaries are higher than the previous average wage was, and also the alleged laundered money from shady international billionaires from unstable countries who want to park their money in a safe place. That overwhelmed supply, the time-on-market dropped from 30 days to 7 days or 3 days, and that allowed prices to accelerate dramatically. If another recession occurs, then a similar number of people may move away as in previous recessions, but the remaining number of residents will be higher than it was in the 2000s, while the housing supply has increased less, so therefore the vacancy rate and time-on-market will remain lower and thus prices will remain higher. Right now companies can’t find enough construction workers for the buildings they want to construct, and that also hinders ST from hiring enough workers for its transit projects, and Metro from hiring enough drivers for the buses it has the budget to deploy. If a recession occurs and some of those projects are canceled and people move away, then there may be more unemployed workers with the right skills ready to take ST’s jobs at a lower rate, but it all depends on the relative rates of layoffs and moving away and new job openings and the Fed’s interest rate and the housing supply and international trade, and how they all relate to each other, and that’s impossible to predict: whether ST would find a glut of workers or an even tighter supply. There’s also the factor of how residents’ income might change and how that might affect tax rates and people’s willingness to pay taxes for transit. That’s hard to predict too. You make it sound like the tax cost is the only relevant issue, and that the light rail line has absolutely zero benefit or relevance to the community. It’s reasonable to say that it will have less benefit than ST claims, but it’s unreasonable to say that it has zero benefit. People need better transit and an alternative to driving, the climate needs less carbon emissions, people need cleaner air to breathe, and the economy needs the productivity of people being able to get to work and activities efficiently without wasting time in increasing traffic congestion, which does have zero benefit. Nobody gets into traffic because they want to be or because it benefits them, they get into it because they can’t avoid it. And yes, we can minimize that impact through alternative means, like building denser housing in the center city and abandoning the exurban fringes, but this polity is not going to approve that in the near term so it’s an irrelevant issue that can’t be used as an excuse to not build the plan outlined in ST2 and ST3. It would be better to build density rather than thirty-mile lines, but to do that we’d need a different set of legislators and a different set of voters, and we don’t have that. Saying that ST is laughing at us all the way to the bank is just false and unfair. Certain politicians in DC did laugh at the religious conservatives who voted for them in 2012, thinking that they would get a ban on abortion and a tax on the Wall Street tycoons who swindled the economy into a Depression, but instead those politicians gave Wall Street a tax cut, sent none of those tycoons to prison, and screwed over the people who voted for them. That’s not at all the situation with Sound Transit and Link. The ST board for the most part believes in public transit’s mission and benefit, wants to see Link succeed because it will benefit the community, and will benefit them as members of the community, and secondarily the ST staff and contractors want to keep their jobs for another 25 years. That’s not laughing to the bank, that’s sincerely wanting to fulfill ST’s mission faithfully and deliver the promised benfits. Any discrepency between the ST plan and an ideal plan was due to the limited understanding, misunderstanding, and existing biases of the people in power and the majority of voters who approved the ST plans and made it politically impossible for any other plan to gain as many votes or sufficient votes and legislative permission to be passed and built. So, it’s either this or nothing, and I for one believe that this is better than nothing. As for $400 champagne, that’s completely imaginary. And as for schemes to take our cars away, that’s a small number of environmental activists, and not what the people on the ST board believe or what most of the people who voted for ST2 and ST3 believe. Some like me think we should ideally minimize cars, and do more of what Germany and Canada are doing, but we’re trying hard to compromise with those who want cars and to accommodate cars, and even more P&Rs than we’d like. Compromise is essential to a functioning democracy: the only things that can be done are what a critical mass of people agree to. The critical mass of people has spoken in favor of ST1/2/3 and transit generally, even if their support is less strong than Germans and Canadians would give. So let’s just get it done and do what we decided to do, otherwise we’re just zigzagging here and there and starting things and finishing nothing. The unexpected real-estate costs and construction costs are just that: basic uncertainties of the future that no agency could possibly predict. ST and the cities are responsible for certain other things, like the list of expensive side demands the cities impose in exchange for approving the construction permits, so that ST doesn’t have to go through a long, expensive, uncertain Eminent Domain process and the city suing them and refusing to cooperate and actively hindering any future project the agency may want to do. That would cost even more taxpayer dollars than what we’re spending now. If we just let ST2/3 die to “punish” the legislators, boardmembers and councilmembers for their backroom deals, we’ll be shooting ourselves in the foot, because then we won’t have the high-capacity transit lines we’d otherwise get. I agree. ST is not laughing. None of the politicians who helped make ST3 (or ST2) happen are laughing. The people who are laughing are the folks who know a thing about transit and have a particularly cynical sense of humor. Those folks find it all funny. I don’t. I feel sorry for the folks in Federal Way, who will end up paying even more for something that was never a good transit value to begin with. Parking should be the first to go. No more subsidizing parking at the expense of station amenities that will affect every single rider for decades. ST continues to bend over gleefully and submit to the will of real estate interests at every obscene opportunity. It’s not the real estate interests, it’s the voters who think parking is a basic essential component of any facility, and the way to get riders to the train. The eagerness to which ST is willing to defile its role in order to appease monied local interests knows no bounds, like a fille de joie on a frenzied journey through fleet week. It’s a judgment call whether ST is yielding to small, politically connected, loudmouth moneyed interests, or whether it knows better than we do what the largest number of voters want, what they’ll demand, and what they’ll tolerate and won’t tolerate. The fact that ST2 and 3 passed by such surprisingly high margins, and in districts that are normally seen as lukewarm to transit and skeptical of taxes, like almost all the Eastside precincts and several unexpected others, suggests that ST’s estimate from its polling may be pretty accurate after all. @Mike Orr. Be careful not to overgeneralize those ST3 vote results. The measure squeaked out a win here in Snohomish County and actually failed in Pierce County as you recall. Right South King has always been a persistent No. Its other characteristics are that it’s poorer, more working class, and its buildings are more unchanged from the 1970s space-wasting era that made walking the most inconvenient it had ever been and drove even more people to their cars. That was considered a good thing and civilizational progress at the time, and an example of American exceptionalism and superiority, but it has since then been widely reinterpreted as a mistake, the wrong direction, and somehting we need to reverse as quickly as possible so that people no longer suffer unnecessary harm from delusional Futurama ideology. This relationship between lower-income, working-class status, car preference, anti-tax preference, and anti-transit tax preference, is actually very common across the country. You see it again and again. Rainier Valley is also similar: it’s lower income than Central Seattle and near-North Seattle, is less supportive of transit and transit taxes, and more supportive of car and freeway infrastucture. During the McGinn-Mallahan race, when McSchwinn was seen as the anti-viaduct tunnel, pro transit and streetcar candidate and Mallahan was seen as the business-as-usual pro-viaduct tunnel candidate, Central and North Seattle voted for McGinn but Rainier Valley voted for Mallahan. Rainier Valley is also where Save Our Valley appeared, and where the most demands for P&Rs near the local Link stations came from. In Chicago, the wealthier North Side has lots of legacy transit structure and is pro transit and urbanism, but the South Side especially some of the outer parts are poorer, more working class, and more skeptical of transit projects in their area or anywhere, especially some of the outer parts, like in one article I read where the neighborhood was deciding whether it preferred a proposal to extend an El line to them, or a competing proposal to extend a Metra line to them. To me there’s no debate because El lines are much more frequent (every 5-10 minutes rather than every 30-60 minutes), a longer span of service (sometimes 24 hours), and have closer transfers to other El lines going to urban, walkable, inner-city destinations. That makes it really easy to get around without a car anytime, and maximizes ridership and the number of pedestrians and non-drivers. But some residents in that area preferred the Metra alternative for some reason, even though it would have been more limited service, and less useful for non-drivers. I think that comes from the “car/commuter rail” mentality. When low-density car-dependent suburbs and shopping malls on greenfield freeway exits were popularized in the 1950s, one of the assumptions was that they were for middle-class people who could easily afford to drive and always would. But since then urban economics have inverted, and the scarcity of walkable, transit-rich neighborhoods (because of ever-more contrarian zoning causing a mismatch between supply and demand) have caused the most walkable, transit-rich, inner-city areas to be the most expensive to live in rather than the least, so now rich yuppies move to them and displace poorer working-class people to the outer neighborhoods, suburbs and exurbs that weren’t built for them and have less resources to cope with the substandard infrastructure. But at the same time, the 1950s middle-class belief that cars and low-density neighborhoods were higher status has trickled down to the working class and the rest of society, and now when middle-class people are abandoning this idea, working-class people are forced to live involuntarily in these outer areas that the wealthier don’t want anymore, in more difficult conditions, which all other Western countries have recognized is wrong, inequitable, and classisst/racist. Somehow the influence of seeing working-class people value cars and low density as high status rubbed off on them in the 60s, 70s, and 80s, and now another phenomenon is happening on top of that: the fact that they’re being forced to live more car-dependent places with less non-car infrastructure to mitigate it, is making them cling even more tightly to their cars, and demanding freeways and P&Rs even more, and supporting transit and transit taxes even less. This is a toxic downward spiral, and we’ve already seen it once with the rich and middle class, and now we’re seeing it a second time with the working class, poor. And the majority of white Christian Republicans who’ve been convinced by Rush Limbaugh that cars and SUVs are a symbol of American freedom, the ability to go where you want and when you want without asking some liberal elite’s permission, and to give a Bronx cheer to the environmentalist pinko fewer-cars-more-trains-to-lower-carbon-emissions campaign, because I’m a big strong tough guy and I’m more powerful than climate change and it won’t happen for a century anyway or rather it will never happen because it’s a hoax. So South King County opposed ST3 and the last two countywide Metro tax measures, saying they’re too poor to afford the taxes, and what they more need is highway lanes and garages so they can get to work, even though the transit infrastructure would lower their out-of-pocket expenses and help them climb to a more secure and higher standard of living. But at the same time they’re adamant that they must have a Link extension to Federal Way, that’s their highest priority, and they’d prefer it to be on I-5 rather than 99. And for their second priority, they’d like a Burien-Renton Link line. Never mind that the highest-density, most walkable, most multicultural, highest-population, and heavily working-class part of South King County is in Kent East Hill, so a line from somewhere to Kent or more frequent Sounder would the most cost-effective and useful investment. But ST has never made even a Link concept plan for Kent, and while ST3 has more frequent Sounder, this Federal Way extension displaces even more Sounder runs. I haven’t followed Pierce County as closely so I don’t know how it voted in ST1 and ST2. But in the past decade we’ve seen southeast Pierce secede from the Pierce Transit district because they don’t want to pay transit taxes or any taxes. At the same time they’re the loudest saying that ST3 doesn’t benefit them, the nearest Sound Transit amenity is an hour’s drive away from some of them, and they want the highest-cost-per-rider projects of anybody in the ST area rivaling only Everett, such as a Sounder extension to Orting, more feeders to Sounder, and asking the state for a Cross-Base Highway because they don’t have enough freeways. All these proposals are designed to accomodate their low-density, car-dependent lifestyle, so they can live in the middle of nowhere and drive to a Sounder station and park in a P&R (preferably free). Never mind that we could spend the same or even less money building infill density in Tacoma or anywhere, bringing it up to the density of Chicago’s North side or Vancouver BC, which are very desirable and status-enhancing places with the fastest-rising property values to prove it, which will guarantee that you’ll be able to sell your townhouse or condo for enough to have a very comfortable retirement. But no, they want less density, less transit taxes, more P&Rs, and more long exurban train lines to areas like theirs. Tacoma city and Lakewood voted for ST3 while southeast Pierce voted against it. The net result was because southeast Pierce and the other No voters have a higher population than Tacoma and the other Yes voters. You see the same thing in blue states, where rural Republicans are angry that they’re not the majority and have to suffer policies they disagree with because they’re, and in red states where Democratic cities are angry they’re not the majority and have to suffer policies they disagree with because they’re outvoted. Another factor is that southeast Pierce, along with Mercer Island, is the centerpoint where the highest concentration of anti-MVET thinking is, and the proposals to opt out of ST3 taxes if the don’t like the projects in ST3, and to get all MVET capped at $30, and to sue ST becuse it’s using a higher MVET valuation schedule than another alternative. So a lot of noise by people who want the most expensive infrastructure for the least number of people and they want somebody else to pay for it. That’s exactly what’s been happening in the suburbs for sixty years now, the lowest-density the most intense. They’re blind to the fact that their infrastructure costs more per person, even though they’re taxed at the same rate as city-dwellers (who often are poorer than they), and they somehow think this is normal and they’re entitled to it, and they think that stores and transit stations should provide free off-street parking because how else can people get to them, and it’s the store’s or transit agency’s responsibility to pay for the parking because their existence generates the need for parking at them. and they should be grateful that we’re spending our money at their facilities and approving taxes so that they can build their stations. uh oh. Be sure not to tell Durkan. She’ll call in the national guard, then shut it down and claim Siemens cars have wings. Are revenues also going up? It stands to reason that with a good economy the sales tax revenue collected might end up being higher than projected too. 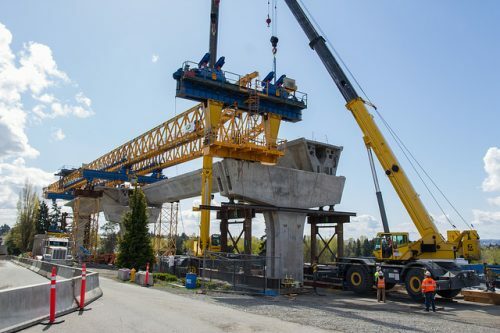 Local tax income for rail and bus projects has increased too, but South King County revenues earmarked for the Federal Way project lag the region as a whole, said Sound Transit spokesman Geoff Patrick. The latest financial models show a $113 million shortfall in South King County over two decades, compared to pre-election projections, Rogoff told the board. Yeah they’re going up but asymmetrically. I bet that East and N King are flush, S King and Sno not so much. Rogoff said as much yesterday that they agency could cover the cost increases, but not in alignment with subarea equity. I have a feeling that will be a big convo this fall. Subarea equity has always been the worst policy except for all the alternatives, strongly irrational but saving ST from suburban bad faith. Were it to go away, I bet the bullseye would be on Ballard in favor of Everett. Has your salary risen? Has it risen faster than your rent or house prices? No? Has it done the opposite? If it’s done the opposite for you, and your saiary has increased less than housing costs, maybe it has done that for a lot of other people too. In any case, revenues are high now and have been high ever since 2014, when Metro did the first round of recession cuts and planned to do two more rounds, but Councilmember Dembrowski said no, the economy is recovering and tax revenue will soon be higher even at the existing rate, and argued that we should cancel the remaining cuts and hope for the best. The council agreed, and it was an irresponsible bet, but luckily for Dembrowski it turned out as he gambled and the bet paid off. Tax revenue is still high, both with the robust number of current jobs and new job openings and the continuing influx of new residents (i.e., new taxpayers). How long that will last, and how changes to these three factors might change the absolute amount of tax revenue either higher or lower, is subject to interpretation. Just like the question of when the next recession will be and how severe it will be. There are several factors that tend toward recession now, but most of those factors have been active continuously since 2005 and they didn’t cause a recession then but they did in 2008, and one with a completely unexpected size and nature. (Unexpected to most people. I remember in 2005 my relatives in Nevada saying real-estate construction had completely halted there. And in 2007 my friend sold his house in Vancouver WA when everybody thought the market was just going up and most realtors were telling clients it was a great time to buy because you could flip the house quickly and make a mint, but his honest real-estate agent said the market was about to revers hard and and it was a bad time to buy. And in July 2008 George Soros said in a radio interview that the only retirement investment he’d recommend at that time was US Treasuries because everything else was about to fall off a cliff, and then two months later it did. We live in one of the richest regions in the wealthiest country in the history of the world. Acting like we can’t afford stellar, high-quality mass transit––and living in a mindset of austerity––is colossally stupid, and we’ll regret it down the road. Make a couple small alterations, fine. But ultimately, the money is there. We just don’t have legislators willing to push for a mechanism to access it (i.e. income tax, state capital gains tax, inheritance tax, etc., etc., etc.). As long as we are willing to proportionally tax those – the high-income programmers, managers, and executives at places like Amazon and Microsoft – then, sure. I have yet to see a progressive tax proposal that gains traction. As long as the majority of people can’t afford to make ends meet and keep getting squeezed, and as long as we tax the majority at the same rate as the wealthy, we’ll live in a state of austerity. We need a state income tax. Currently, we aren’t taxing the majority at the same rate as the wealthy – we’re taxing them based on their non-grocery purchases, which I’ve heard works out to taxing poorer people at a higher rate. Even a non-progressive flat income tax would be better. We can pass that without changing the state Constitution, and perhaps we should. Or we can focus on taxing wealth through property taxes. This is normal. During boom times, long-term construction projects bust their budgets due to increased costs, but higher-than-anticipated tax revenue partially makes up for it. In recessions, those same projects are under budget, but tax revenue is short as well. All the commenters pulling their hair out above are being unreasonable. This project went through our most recent recession. Budgets are important, even in the public sector in which this agency operates. It’s truly remarkable the way ST quietly slips out their annual financials every June with little public attention. I believe in recent years those same financials don’t even compare the variances to budget and simply compare the latest year results to the last two years. I guess this agency feels no obligation to publicly report both types of variance, which truly is a disservice to taxpayers. Sound Transit has imho always been weak in the area of financial reporting. Hopefully this will change with McCartan no longer at the helm, but the lack of a 2018 Annual Financial Plan (the 2017 plan wasn’t published until the end of the year during the 2018 budget cycle) this far into the year indicates to me that the status quo is prevailing. Sad. Not really, it was deferred entirely by the recession and never formally budgeted. Then new funding passed as the economy boomed, and lo and behold costs are up 20+%. Not surprising. This project … hasn’t been built yet. How can you say it went through the last recession? That comment above was intended to be a reply in an earlier section. I have no idea as to why it got posted here. Weird. Anyway, Federal Way Link has been in the planning process since before the ST2 ballot measure was passed. The timeframe being reset doesn’t change that fact. Nor does whether the project has entered the construction phase. Please. If it makes you happy, substitute the colossal cost estimate miss for Lynnwood Link here for “this project” in my commentary. The point remains the same. The generalization that “In recessions, those same projects are under budget,…” remains a dubious one. Well, today’s comments have finally changed my mind on something I’ve always opposed. Will now advocate that the Sound Transit Board be completely elected. But only the condition that everybody ripping ST’s performance and capability to shreds today actually wins a place on the Board. Promise I won’t quote any of your comments today during your campaigns and terms of office, or even show up at every Board meeting specifically to yield my time to Alex Tsimerman. Just occasionally lock you all in the Ruth Fisher room with him. Because you’ll discover the worst thing about being a fascist, as Alex always insists he whole Board is, is the mistaken conception that at least Mussolini got the trains running on time. Truth is, reason the other side shot him was because the Buy Italian requirement dictated that he buy every train from Breda. Well, Arrivederci e Buona Notte! Run for it, Joe! 1. ST systemically puts their contingencies too low! This probably will occur for EVERY project for the next few decades because of this basic problem. 2. Unlike Lynnwood, ST3 is paying for some of this. As a result, the need to scale back could be taken rom somewhere else. For example, the South Federal Way Station could be tabled to pay for this. There is a possible silver lining. A delay to Federal Way (and probably Tacoma Dome) will ease train loads at Seatac and in the Rainier Valley — sure to be a problem once these extensions open. It’s especially relevant if ST does a West Seattle shuttle ending at SODO. It’s pretty obvious that the system as envisioned in 2015/2016 can’t be built within the budget that was approved. Something has to give, and my thought is that the parts in Seattle south of IDS and north of Dravus are the prime candidates. And of course the silly line between Issaquah and South Nowhere. Two water crossings would be eliminated and some buses can still be swept out of downtown. Basically, the transfers would be moved from Alaska Junction, Delridge and Andover, and 15th NW and Market a mile to a mile and a half farther along. Create excellent transfers at 15th West and Dravus and at SoDo Station and you have saved three or four billion dollars. Not to put too fine a point on it, but West Seattle doesn’t really want mass transit. They want the trappings, but not the essence which would mean upzoning the areas around the two stations significantly. Ballard is much more gung ho, but really, adding only one station is not enough to justify the high costs of the water crossing. Especially since Sound Transit seems dead set on a bridge with all the operational problems that entails. Wait a decade to make a decision on that water crossing, and I guarantee that the region will be glad to stump up for a tunnel which can then branch both to UW and a couple of stations beyond and on north to North City and into downtown Shoreline. Will this reduce ridership? Yes, certainly, but the vast majority of commuters from Ballard and West Seatte are still going to ride their neighborhood expresses right to downtown even if the West Seattle Stub and the Ballard Station are built. And delaying the extensions into Ballard proper and out toward West Seattle will allow a clearer future to be created. What building the new tunnel from IDS to Dravus does is attack the most expensive parts and essential part in downtown Seattle first, leaving the relatively easy and cheap extensions for later. And nobody knows at this time what will happen north or east of Ballard Station, so building the cheap, grade-level station at 15th and Market that ST envisions may foreclose future options in a very damaging way. Ditto in West Seattle. Will a Burien extension connect at the Delridge Station or at Alaska Junction? Will there even be a Burien extension? Building the stub now as designed won’t work with either option. Would this mean that North King residents will be massively subsidizing the people from South King, Pierce and Snohomish who despise them, many of whom would like to see them dead? Yes, it would, but that is likely the price that will have to be paid to keep things flowing in downtown Seattle. To create an operational system it would be necessary to connect Central Link to the new tunnel while keeping the connection to the existing DSTT. Then run trains from Lynnwood to both Redmond and SoDo using the existing trackage with turnbacks at the Maintenance Facility. The City of Seattle would have to agree to vacate surface-level Royal Brougham between Fourth and Sixth and bridge over the Link tracks at Holgate or close the crossing so that trains can run sufficiently frequently to provide service. In closing, let me say I do understand that buses suffer in the Ballard Bridge congestion, and there’s nothing that can be done within the existing envelope to improve it on the bridge itself. But queue jumps at both ends with bus lanes leading to them are the same things that will be necessary with a station at Ballard and Market. I think the ST BoD and Peter Rogoff are gonna have to have a lengthy and painful discussion about the future of ST and it’s projects and what they see being the best outcomes for delivering said projects. I think how they respond with their plan of action will write the next chapter for the agency and the region so to speak. I do believe that good things can come out of having your back against the wall and the deck being stacked against you, as it forces you to think long and hard about decisions and what to do next going forward.